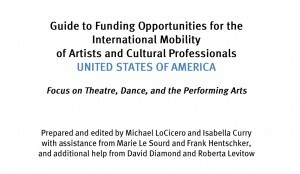 On January 7th 2015, On the Move and several partners (Martin Segal Theatre Centre and Theatre without borders) released in New York City a funding guide for the performing arts in the context of international mobility – putting an emphasis on opportunities for funding travels through private or public partnerships with institutions. It is public and can be shared as long as it is not altered, authors are mentioned, and no commercial use is carried out. FEVIS thanks On the Move for its precious work on behalf of its members.